Black Friday deal: Save 33% on five-star Epson projector today only | What Hi-Fi? Even at £550, this Epson EH-TW650 projector was ‘pretty faultless for its price tag’ - as we said in our recent review of it. Considering it's since dropped to almost half that price, we aren't sure of a superlative worthy enough to describe its value now. Missed the deal? Check out all the Black Friday projector deals. Not bothered about (or don't have the funds for) 4K projection? 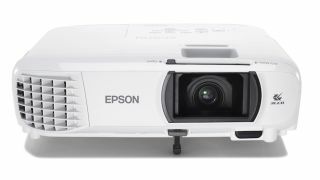 This Full HD Epson projector is a no brainer. It's easy to set up, delivers an insightful picture across the board, and is a good upscaler of DVDs. If you’re ready to make the switch from a TV to an entry-level projector, and want a competent bargain to play Full HD and SD material, it's a fine choice.